Staff productivity and satisfaction is significantly hampered when colleges and universities are slow (or worse, stalled) on the data front. After all, you need to make crucial decisions every day—from choices around marketing spends to registration periods and more—but without the right reports and dashboards you’re left guessing. This can lead to significant and harmful errors in judgement. Even when data is available, it needs to be done right. At institutions that have numerous systems collecting data in different ways, staff are left to run a range of different reports and then spend a lot of time combining and manipulating data in Excel. Ultimately, staff—or IT divisions or internal business analysts—can build a custom report but this can cost a huge amount of time and money. And the end result might be skewed because, with “dirty data,” the outcomes of the analysis can be faulty. The last stage of the lifecycle—one that goes on to feed every other aspect going forward—is leveraging data to tweak, adjust and improve to continue serving students in the best way possible. Shifting to a data-driven culture can help a higher education institution become more student-centric, efficient, effective and transparent. In today’s immensely competitive higher education marketplace—where competition is not only coming from other colleges and universities but private providers and bootcamps—the most sophisticated schools empower their staff and administrators with an easy-to-access archive data warehouse connected to real-time reports and interactive graphical dashboards to make effective business decisions. And this functionality is becoming available more widely every day. Leaders need to trust the source data and the methods used to compile it. It’s critical to have one system of truth, because the last thing any leader wants is different departments using different metrics or calculations for enrollment counts or revenue. What’s more, an effective institution will have accessible and permissioned reports and dashboards that support decision making. Finally, leading institutions have the reports and dashboards they need to operate their businesses available on-demand in real-time. It’s impossible to be successful if you’re waiting days or weeks (or in some cases until quarter or year end) to get data visualizations. Leveraging dashboards and other visualizations that help to turn a spreadsheet into easily understandable trends and shifts can help you ensure they you’re being responsive to student demands. You might find out that the majority of students register a few days before the cut-off period. You might also learn that, for one particular course, the vast majority of students are coming from a specific geographic location you hadn’t considered. This information can lead to strategic decisions that can ensure more students are being served better. Data is at the core of delivering an exceptional student experience in today’s higher education environment. 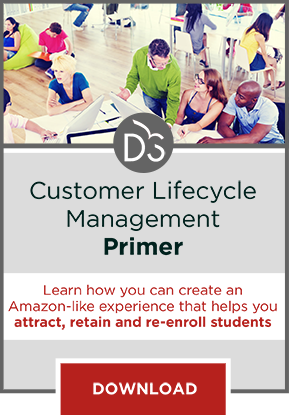 You can bring data into the center of decision making at your institution by leveraging the power of a Customer Lifecycle Management system. Download this primer to learn more.